This of course is in no way a substitute for the real-life, actual, 3-dimensional Leicester Skeptics experience, but if you can’t make it this could be a good second. If for any reason what comes out of your PC speakers is anything less than a virtuosi performance, this will doubtless be wholly due to interwebs interference and you should really have come along to the real thing! Given the disasters, human and financial, that can result when governments lose their grip on reality, it’s arguably in politics that skepticism matters most. Yet from Thabo Mbeki’s disastrous dalliance with AIDS denial in South Africa, to the delusions that led to the Iraq war, our politicians often seem perilously credulous. 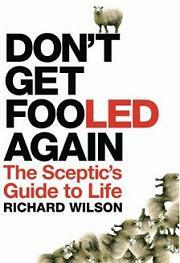 In “Don’t Get Fooled Again“, Richard Wilson looks at why it is that intelligent, educated people end up time and again falling for ideas that turn out to be nonsense, and makes the case for skeptics to be actively engaged with the political process.